I recently received an email from David Morelli about mojo. He was talking about how powerful mojo is. 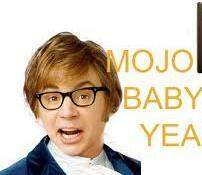 The first thing that popped into my head was Austin Powers and all his mojo talk! But it's not resereved strictly for Mr. Powers. Both men and women have inner mojo, whether we utilize it or not is completely up to us. This cultivation of our mojo, our energy and aliveness attracts people to us. You can imagine how useful this is in business and relationships…any kind of relationship! When we’re expressing our mojo and we’ve got confidence in what we’re doing it shows. David mentions in his mojo videos that fear is a huge factor and can block our mojo from flowing. We often hold back because we’re afraid of how we’ll be perceived. We’re also afraid to put ourselves out there to get hurt again. We’ve all been hurt or rejected in one way or another and it's painful! Emotional Freedom Technique (EFT) is a wonderful tool to use in dealing with fear and emotional blocks. For more information on EFT (also known as tapping) check out my YouTube channel. David pin points three things we need to ask ourselves when we’re discovering our mojo. The first thing is, “What’s your mojo?” He says that his is attitude; he’s confident and self-assured in himself and what he does. Your mojo may come across when you’re doing something your passionate about. Mine comes across whenever I’m helping somone using EFT (tapping). David recommends looking inside yourself and figuring out how and when your mojo appears. The second question is, “What’s your message?” David says we need to unlock our message so the mojo can flow. He has 3 simple steps to take to help you do this. First ask yourself what message you’d regret not sharing with the world if you died today. Second, ask yourself what your unique skills and talents are and how do your talents help the world? Lastly, you must put these things together and discover the purpose of it all, how can you truly help others? David’s third mojo question is, “How do you communicate your message?” What mode will you use to communicate to the world…through video, audio, or possibly live presentations? Video is extremely powerful, it gives a more personal experience. It allows us to have an online presence, reaching many people. Audio allows us to influence and impact many people as well. So you need to ask yourself which medium works best for you and increases the amount of lives you touch. David has an online event Tuesday June 4, 2013 starting at 5:30 PM (pacific time). If you’d like to be a part of it all and learn more about mojo visit his site. Be prepared, David talks very fast and has tons of energy! If you’d like to learn ways to stop living out of fear search Anna G EFT on YouTube. Check out my Facebook page don’t be afraid to like it! I appreciate the likes!